As part of our work to develop new cost effective self-build strategies we recently prepared a submission to the NaSBA Self Build on a Shoestring competition. Although we weren’t successful it was great to see that a number of submissions had proposed a similar concept to ours, exploring the possibilities of single storey housing. The construction proposal is based on what we’ve learnt on one of our current live projects; Rob’s own self-build project called home4self. 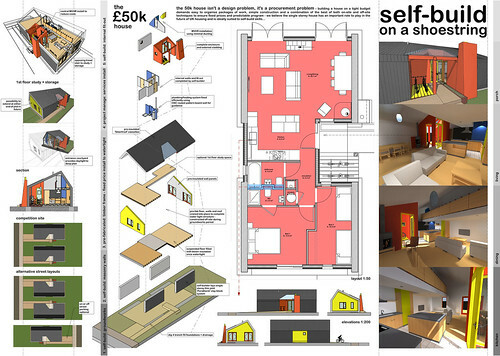 *update*: Delighted to find that our proposal was displayed at the Grand Designs Live show as part of the top 16 entries. Single storey, modern methods of construction and easy to manage packages of work. Our proposal is designed to consider carefully the benefits of combining simple on-site construction processes that could be undertaken by an enthusiastic self-builder alongside the price and performance certainty delivered by off-site prefabrication. We have chosen to explore a single storey house typology. Although this decision brings greater challenges with both the energy performance and ground works, we believe that the benefits to living quality, adaptability and ease of construction make the bungalow a worthwhile investment. One of the greatest challenges for a self-builder is the day to day management of material delivery, storage and plant and equipment required to control health and safety issues of working at height. Using modern methods of construction we aim to provide a large water tight space quickly that allows the self-builder to proceed in a more easily managed process internally. By overlapping ground floor construction and off-site manufacture the initial program of works can be completed quickly with certainty over fixed prices for the bulk of the superstructure. Items of joinery such as stairs and service walls are intended to be designed and manufactured following a pattern that can be repeated cost effectively using CNC routing technology. The prices stated for the pre-fabricated timber frame also assume a standardised panel size that can be called off by self-builders following a common house type plan. The layout of the design has been developed such that it can be mirrored or handed in various ways to suit orientation without changing the fundamental construction dimensions. Once the superstructure is complete the interior can be fitted out easily thanks to the efficient arrangement of plumbing and heating layouts that will require minimum labour and material to commission and avoid potential for delays and unforeseen costs thanks to colliding orders of trade. The central service zone contributes not only to the ease of construction but also the ability to extend easily in future at either end of the building or into the entrance porch, without major alterations to mechanical and electrical layouts. The installation of an MVHR unit in the centre of the plan also reduces complex duct runs and maximises efficiency of performance. Open plan living places the kitchen at the heart of the house. Our courtyard entrance strategy provides daylight to the centre of the plan and creates a useful external storage area. By completing the roof in pre-insulated panels the higher levels of the pitched roof can be left open above living spaces and enclosed over bedroom areas to provide ample storage. We believe this is a house that future self-build families could be encouraged to undertake and project manage their own construction when offered a design that is easy to imagine and plan the work required, both in scale and order of trades. Final preparations are under way for our collaboration with Stoke City Council and Buildstore next week at the launch of the Custom Home Build project. Initial proposals for one of the sites being offered are complete and we’ll be presenting them to the public and discussing the future of the scheme. 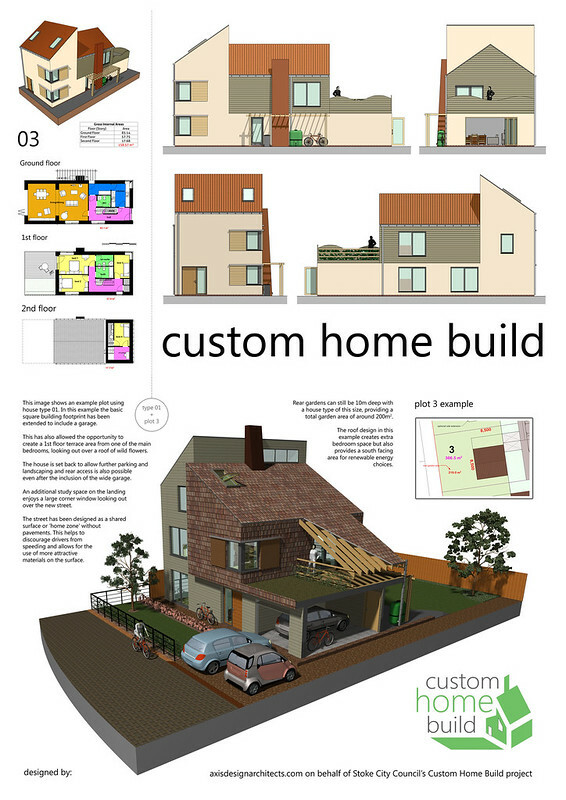 To get the debate started we’ve created some example house types that self builders might consider. We’ll also be providing info about our Passivhaus research and showing examples of materials and products that we think a self build project could benefit from. More images can be seen in our flickr gallery. We’re delighted to report that along with our team of sub-consultants, we have been successful in a competitive tender for Stoke-on-Trent City Council’s first Custom Home Building project. The former Penkhull Farm site on Newcastle Lane in Stoke-on-Trent has been chosen by Stoke City Council and the design team led by Axis Design will be carrying out an initial site appraisal and submitting an outline planning application. 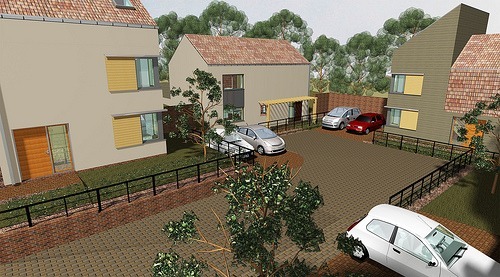 The outline application proposals will be designed to provide guidance to future investors regarding the key principles of the site and must acknowledge the need to create low energy homes. Our recent work around the Affordable Passivhaus project led us to develop house type models that deliver the highest level of energy performance at low cost. We hope there will be an opportunity to incorporate our PassivHaus research into this project. In our experience the most successful housing developments are those created through a collaborative approach. As such, the Custom Home Building project will be supported in its delivery through the use of our web-based project management system to improve liaison with all stakeholders. In addition, we will be including the use of BIM as part of our service on this project. A little more about Custom Home Building in Stoke…. The Government published their Housing Strategy paper in November 2011, and are proposing to offer financial support for self-build developments, referred to as ‘Custom Home Building’. Through this paper (pdf of ‘Laying The Foundations’), councils are being asked to assess the demand for custom-build in their area and take positive steps to facilitate it. Stoke City Council recently launched their Mandate for Change, setting out a clear plan to make Stoke-on-Trent a great city to live in and in support of this, there is a proposal to promote Custom Home Building to assist in improving housing quality across the city. The council are hosting a Housing Summit later in 2012 and this project will be used at the event to publicise Custom Home Building to local residents and potential partners.